How much time do your employees actually spend at work? 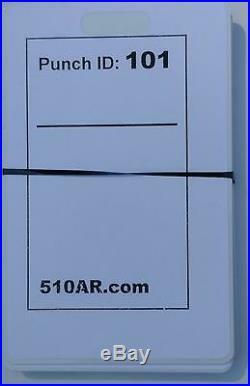 The 510AR is the easy to use tool for you. Employees push a button or swipe a card each time they START/STOP working. The 510AR lets you see a listing of their time spent working with totals IN REAL TIME. Accurately track employee work hours. 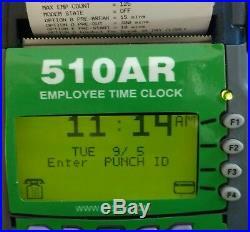 A digital time clock is a modernized version of the punch card clock. 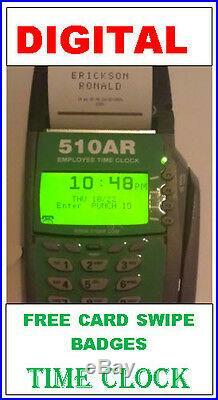 Instead of inserting a time card, the employee keys in a PIN code or swipes a card to record the date and time. Making traditional paper punch card machines obsolete. What would an extra hour a day saved by accurately recording exact time. Employees punch IN/OUT be worth to you? Eight hours in a week? Forty hours in a month? 500 hours in a year. 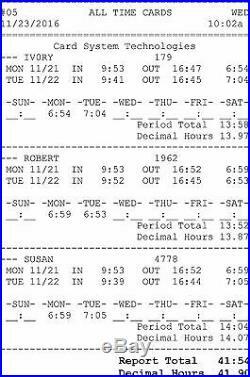 Totals daily and pay period hours worked for any pay cycle. Simple to setup and easy to use. Daylight savings, short month and leap year automatic adjustments. 0-23 hour format and regular (00-59) minutes, total in. Hours:Minutes and Decimal Hours. Internal Battery retains time, date, and program settings. Is for an electronic, thermal printing, card swipe, employee time clock that is particularly suitable for small businesses and offices to manage up to 125 employees time-keeping and attendance, in real-time, quickly and efficiently. Print instant Time Cards using its internal, super-fast internal printer (18 LPS). 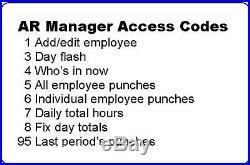 Includes10 re-usable employee swipe cards, 20 generic employee setup, record unpaid or paid work breaks. This unit sets up in minutes. With 20 generic employees pre-loaded, starting with ID 101 (name is EMPLOYEE 101). Be up and punching in minutes. Makes Paper Punch Cards Obsolete. Internal Thermal Paper Roll Printer g. Ives fast and clear printing on inexpensive thermal paper. No Need to Use Ribbons or Ink, No Need for Expensive Thermal Cards, No Need to Position of Paper Cards, No Need to Identify Front & Back Side of Paper Cards. Quiet High Speed Thermal Printer - Prints 18 Lines per Second. Select any pay period, Weekly, 2 Weeks, Bi-Monthly, Monthly. Assign Workers to a Department to Meet Different Working Time Arrangements. Auto-adjusts for Number of Days in the Month, Leap Year and Daylight Savings Time. 8 by 4 Tabletop or Shelf Mounting. 2 1/4 x 85 ft.
No wires to connect, self-contained card swipe reader and printer. Use it "out of the box" with 20 generic employees pre-loaded. Office, break room without a PC or Internet connection. T is truly Standalone Operation. Swipe cards and pre-setup allows employees to start using immediately upon receipt of the machine. 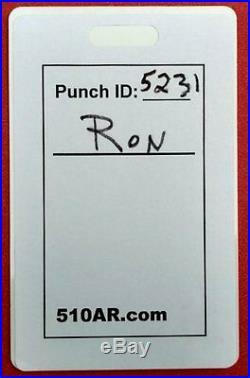 Sample Individual Employee Time Card. You do not have to change the format of the hour totals format as the AR prints both hours/minutes and hours/decimal period totals in the same time card report. 02/24/201x By Name 9:06a. WED 03/16 IN 11:20 OUT 16:58 5:38. THU 03/17 IN 9:43 OUT 16:50 7:07. FRI 03/18 IN 9:49 OUT 16:57 7:08. TUE 03/22 IN 10:00 OUT 16:58 6:58. WED 03/23 IN 10:15 OUT 16:51 6:36. SAT 04/02 IN 9:53 OUT 15:55 6:02. SUN- -MON- -TUE- -WED- -THU- -FRI- -SAT. __:__ __:__ 6:58 12:14 7:07 7:08 6:02. PRINT WHO'S IN LIST. PRINT ALL TIME CARDS (PULL SHEETS). 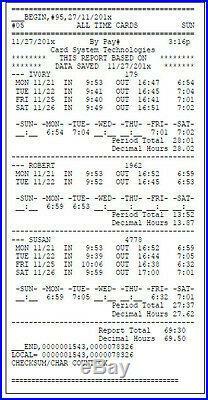 PRINT INDIVIDUAL TIME CARD (PULL SHEET). Roll 21/4 in by 85 ft thermal paper roll (available at office supply stores). 10 reusable magnetic swipe card/badges. The item "WAREHOUSE Digital Employee Time Clock, FREESTANDING, punch/swipe, printer" is in sale since Sunday, July 19, 2015. This item is in the category "Business & Industrial\Office\Office Equipment\Time Clocks & Supplies\Time Clocks". The seller is "bertbert1" and is located in Virginia Beach, Virginia. This item can be shipped to United States.